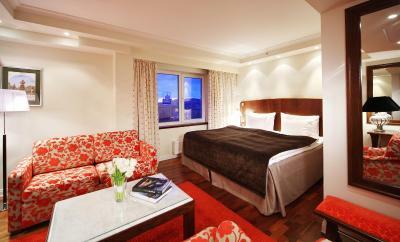 Lock in a great price for Original Sokos Hotel Olympia Garden – rated 8.7 by recent guests! Modern and cleanliness. Staff was friendly. The bed was comfortable and the pillows were great. The windows was good with open view. Not too far from Metro. Nearby beautiful garden. Nearby nice supermarket. Nearby Bushe bakery & reccommend restuaraunt. 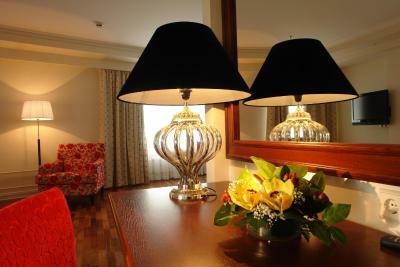 Excellent location, nice spacious rooms, excellent breakfast, great staff. Loved my stay! The rooms are very good, as is the restaurant. The foyer is, however, too small and often crowded, likely trying to force visitors into the nice sports bar that is at the hotel. Excellent value at the particular time of year that I stayed there. 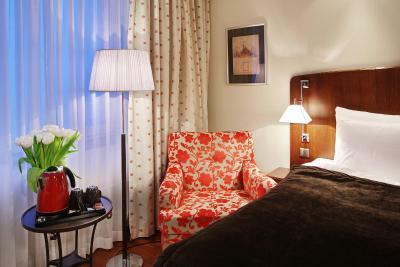 Very helpful staff, lovely clean and comfortable room, excellent meals served by the restaurant at night, well done, the chef has to be complemented :-) Location is not near Nevsky Prospect but it is very close (10 min walk) to the Technologichesky Institut metro station and from there you can get all around the city pretty easily. The satffs are very nice and helpful. They can speak English very well so, there is no problem to communicate with them. 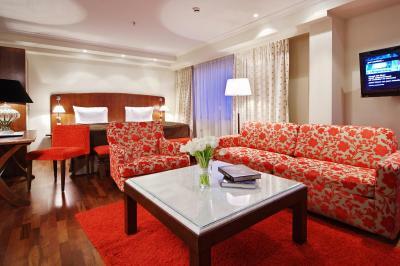 Our suite was spacious, and had comfortable furnishings. It's a 500 metre walk to Technology Institute subway station, and only a short trip to Nevsky Prospekt (or Vosstanya, for the Galeria). The hotel staff were very helpful, and could speak in a number of languages. A pleasant surprise was the gift of champagne from the hotel on my birthday, which was during our stay. Staying here each time I come to Saint Petersburg, location is perfect, room has everything one might need, friendly stuff and a comfortable bed. 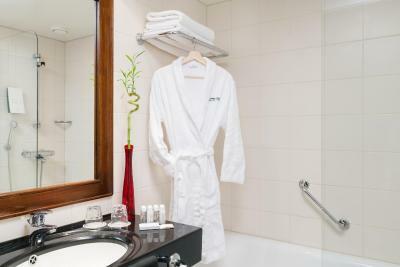 Original Sokos Hotel Olympia Garden This rating is a reflection of how the property compares to the industry standard when it comes to price, facilities and services available. It's based on a self-evaluation by the property. Use this rating to help choose your stay! 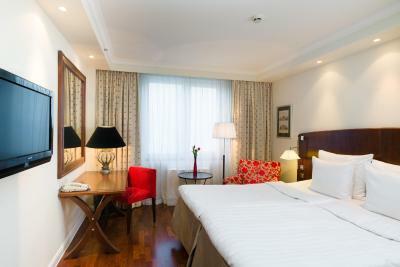 One of our top picks in Saint Petersburg.Original Sokos Hotel Olympia Garden is located directly opposite the Olympia Park in Saint Petersburg. 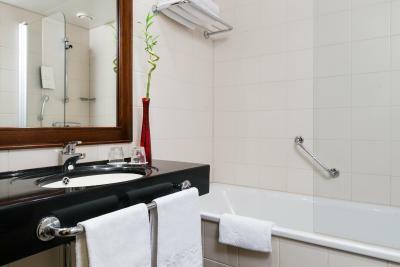 The property offers free WiFi and stylish rooms with a flat-screen TV. 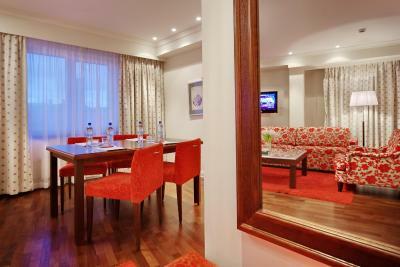 The Mezzanine floor of the hotel features 14 conference rooms. 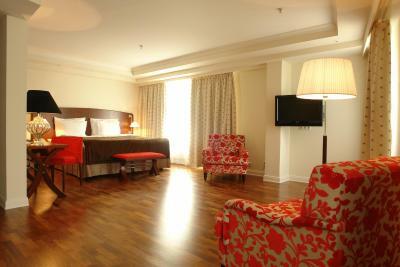 All interiors at Original Sokos Hotel Olympia Garden are warmly furnished with rich colors and wooden floors. 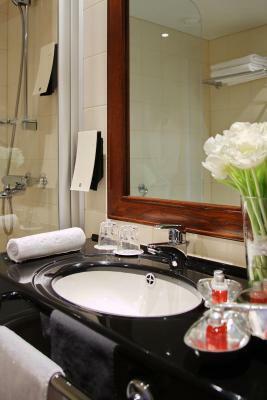 The luxury bathrooms include a bath, shower and toiletries. A full breakfast buffet is served at the Sokos. 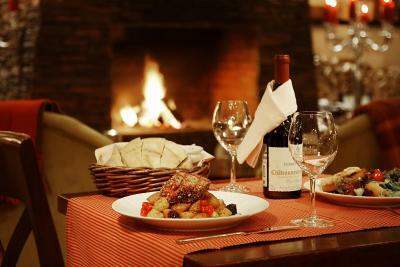 Guests can also enjoy Russian and European cuisine in Mr. Grön restaurant, which features elegant décor and an inviting fireplace. 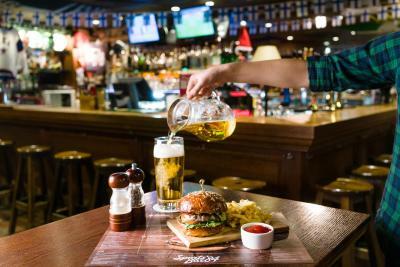 Sports' Bar 84 screens sports games and offers a variety of beer and burgers. 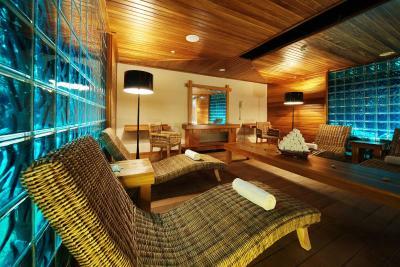 Guests at Original Sokos Hotel Olympia Garden are welcome to relax in the gym, sauna or in the lobby bar. 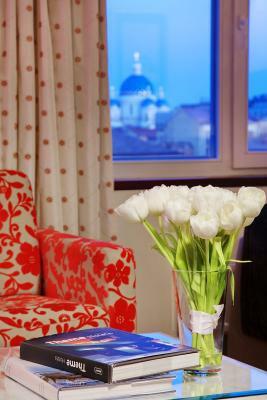 The 24-hour reception can offer travel tips or a shuttle to St. Petersburg Airport, 6.2 mi away. 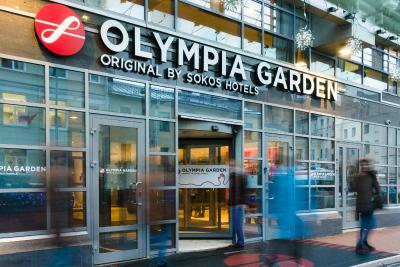 Underground parking is available at Original Sokos Hotel Olympia Garden. 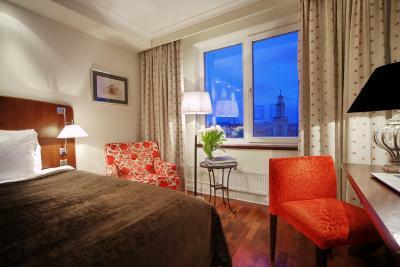 It is a 5-minute walk from Tekhnologicheskiy Institut Metro Station, 2 stops from the Nevsky Prospekt. 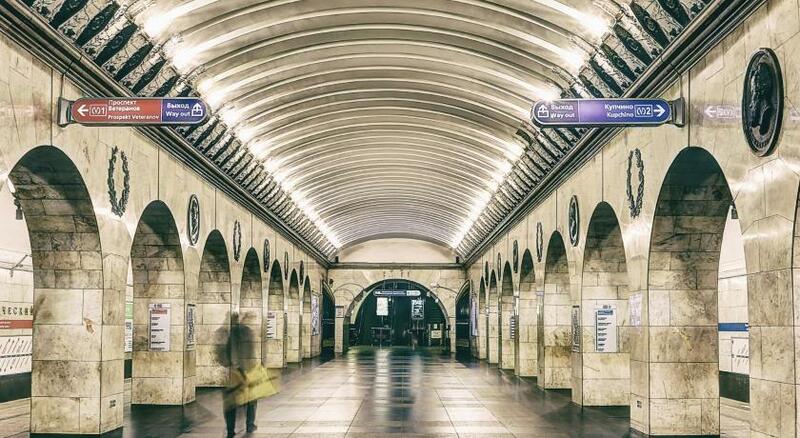 Moskovsky Train Station is a 25-minute drive away, and Expoforum is a 30-minute drive of the property. 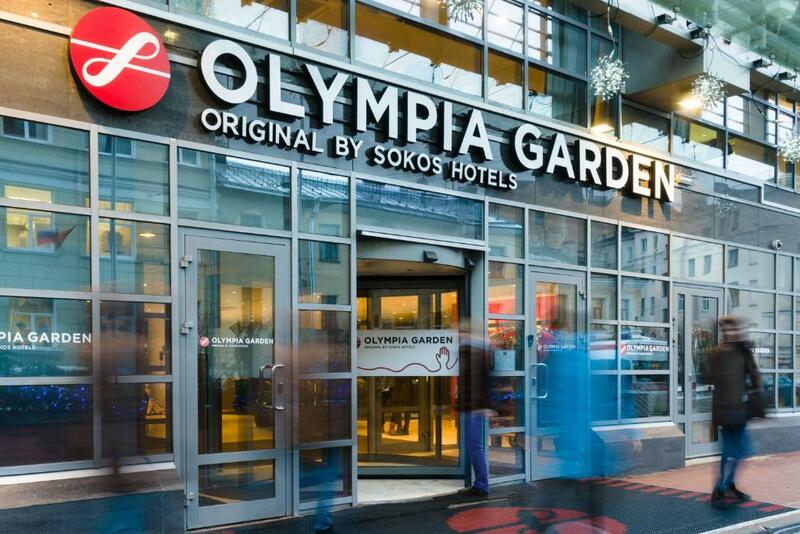 When would you like to stay at Original Sokos Hotel Olympia Garden? Private parking is available on site (reservation is needed) and costs RUB 1000 per day. 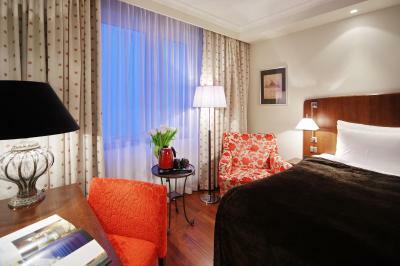 This large room includes tea/coffee making facilities and luxury amenities. Hotel surroundings – This neighborhood is a great choice for travelers interested in cathedrals, history and architecture – Check location Great location - show map Guests loved walking around the neighborhood! 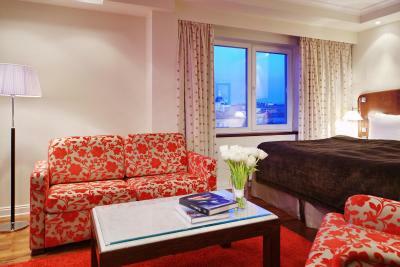 House Rules Original Sokos Hotel Olympia Garden takes special requests – add in the next step! Original Sokos Hotel Olympia Garden accepts these cards and reserves the right to temporarily hold an amount prior to arrival. Please be advised that when booking 9 or more rooms, different policies and additional supplements apply. Food at restaurant just basic. Lot of varieties at breakfast. Nice, clean rooms. Only filter coffee is available for breakfast. No espresso or cappuccino. Overall, it is hard to find good coffee in St. Petersburg. Otherwise breakfast was good but you have to come early to have a chance to find a free table in the breakfast space. Air conditioning system did not work for heating. However, a heater was provided on request by hotel staff. The location is great if you wish to stay near center and at the same time not far from the airport. The bathroom could be too warm and the door could not keep open. The bathroom was a bit small, not much space to store our toiletry. We did not know how to operate the heater properly, thus the room was too dry. Location is not perfect but still ok.
Great hotel! Probably the best breakfast I've ever seen. Very friendly staff. Bar opens till 5 in the morning. The furniture looks a bit old-ish or over-used maybe. It's very noticeable how many guests stayed in the room before. Also, I had dirt on curtains in the room but didn't ask for a change as it doesn't matter to me that much. It's not like it's been dirty because of not laundering for a long time, it's more about oil-ish dirt which can't be cleaned up totally and it's bound to the curtain forever (also, some kind of an over-used thing example). It was good overall. There were excellent breakfasts, quiet and clean rooms, nice staff. I'll definitely stay again when I have the next business trip. Rooms need a little been of renovation, rubber on the bottom of the shower door was so old it came off and it was hard to avoid water going all over the place. Room looks exactly like on the picture. 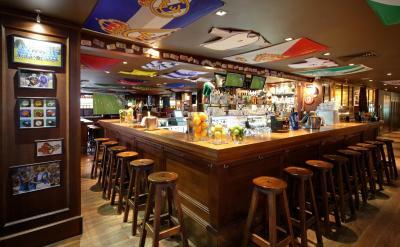 Very nice staff, good location. Very comfortable beds and room itself was very clean. The concierge Victoria Bobrinskaya was really nice and helpfull. Empty minibar in the superior room. I arrived really late and craved the beer, but ... no luck. Another small thing that 250 RUB is charged automatically to the bill for the registration. Surprizingly it does not happen in the other hotels/cities of Russia. No big deal, but still, when you book this information could have poped up, but it has not. 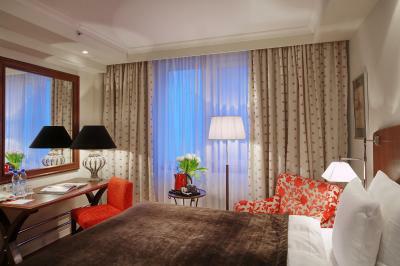 We stayed at Olympia Garden for one night as we were only in town for an event. Concierge and hotel staff were extremely helpful during this time, arranging our event tickets, recommending restaurants for lunch and dinner and booking tourist tours for our limited time. We opted to upgrade to a Superior room, and were not disappointed. 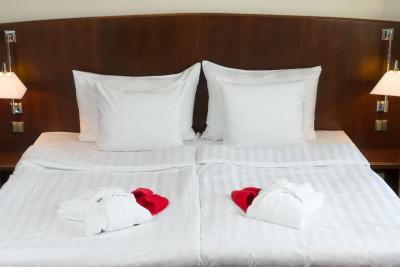 The comfortable bed and lush pillows were ideal after a full day of travelling and activity. it was VEGAN options in the description of breakfast. THIS IS 100% NOT TRUE this hotel have no idea what does it mean. shame.